That Place I Used To Know – Floating Goose Studios Inc. Within this exhibition Jessica Nolan will be exploring the concept of Emotional Geographies and their relationship to memory through places and objects. The objects and places that people hold on to regardless of their origins all accrete their own stories that are specific to the individual who owns them. The notion that every emotion or empathetic connection to the physical world is understood through memory of previous sensuous interaction is pivotal to the consideration of Emotional Geographies; it is these ideas that will be driving this work. In her collages Nolan aims to generate relationships between the places within the imagery and memory by using photographs of locations in times of transition. Working with the idea of physical spaces that can act as a portal or gateway to something ingrained in memory. That Place I Used To Know will use projection in place of physical photographs for the main work. 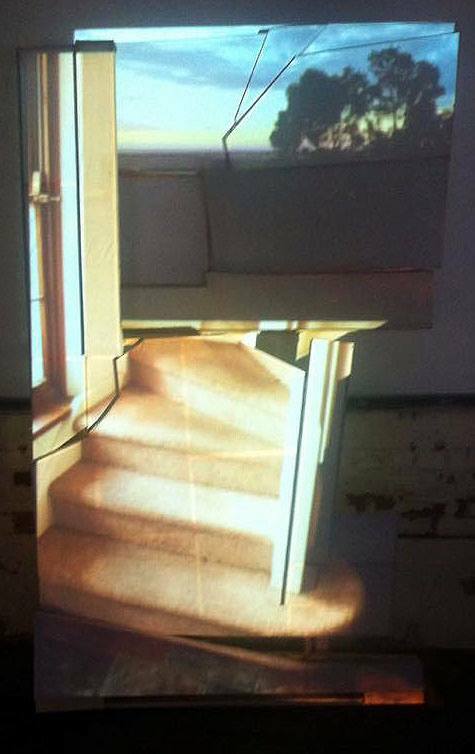 Using projection allows not only for greater scope in installation size and composition, but also a different kind of distortion almost like a visual representation of memory. The projection work will take feel like something from a distant memory, immersing the viewer into the work. This response will be achieved through the use of interactive elements such as changes to the projection due to the movement of the audience and changes of the actual imagery. That Place I Used To Know will run from the at Floating Goose Studios. Sponsored by Adelaide City Council.